The original query used user variables and ORDER BY on derived tables; the behavior of both quirks is not guaranteed. Revised answer as follows. I think it is worth mentioning that the key part is to ORDER BY id since any change of the value of id will restart counting in rank. Why should i run it twice to get the response from WHERE rank <=5? For the first time im not getting 5 rows from each id, but after it i am able to get as you said. @BrennoLeal I think you are forgetting the SET statement (see first query). It is necessary. In newer versions, the ORDER BY in the derived table can, and often will, be ignored. This defeats the goal. Efficient group-wise are found here. @RickJames you are right. Rewrote the answer. Took some working, but I thougth my solution would be something to share as it is seems elegant as well as quite fast. Note that this example is specified for the purpose of the question and can be modified quite easily for other similar purposes. If you have rates that repeat for the same id, then this will not work because your rowNum count will increase higher; you will not get 3 per row, you can get 0, 1 or 2. Can you think of any solution to this? Please try below stored procedure. I have already verified. I am getting proper result but without using groupby. works perfectly. No complicated query. Please note that if more than one row can have the same rate, you should consider using GROUP_CONCAT(DISTINCT rate ORDER BY rate) on the rate column instead of the year column. The maximum length of the string returned by GROUP_CONCAT is limited, so this works well if you need to select a few records for every group. Clever trick and nice explanation! That's beautifully performant, comparatively simple, and great explanation; thank you SO MUCH. To your last point, Where a reasonable maximum length can be computed, one can use SET SESSION group_concat_max_len = <maximum length>; In the OP's case, a non-issue (since the default is 1024), but by way of example, group_concat_max_len should be at least 25: 4 (max length of a year string) + 1 (separator character), times 5 (first 5 years). The strings are truncated rather than throwing an error, so watch for warnings such as 1054 rows in set, 789 warnings (0.31 sec). If i want to fetch exact 2 rows rather than 1 to 5 than what should I use with FIND_IN_SET(). I tried for FIND_IN_SET() =2 but not showing result as expected. FIND_IN_SET BETWEEN 1 and 5 will take the first 5 positions of GROUP_CONCAT set if size equal to or greater than 5. So FIND_IN_SET = 2 will take only the data with the 2nd position in your GROUP_CONCAT. Getting 2 rows you can try BETWEEN 1 and 2 for 1st and 2nd position assuming set has 2 rows to give. This solution has much better performance than Salman's for large datasets. I gave a thumbs up to both for such clever solutions anyway. Thanks!! for those like me that had queries time out. I made the below to use limits and anything else by a specific group. This is nice but MySQL has no window functions (like ROW_NUMBER()). 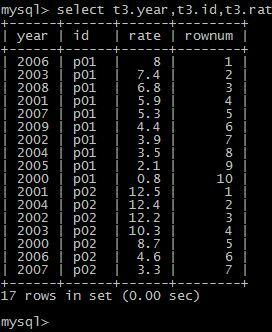 As of MySQL 8.0, row_number() is available. The following post: sql: selcting top N record per group describes the complicated way of achieving this without subqueries. It is however not pretty. A good solution would be achievable were Window Functions (aka Analytic Functions) enabled in MySQL -- but they are not. The trick used in said post utilizes GROUP_CONCAT, which is sometimes described as "poor man's Window Functions for MySQL". No, you can't LIMIT subqueries arbitrarily (you can do it to a limited extent in newer MySQLs, but not for 5 results per group). This is a groupwise-maximum type query, which is not trivial to do in SQL. There are various ways to tackle that which can be more efficient for some cases, but for top-n in general you'll want to look at Bill's answer to a similar previous question. As with most solutions to this problem, it can return more than five rows if there are multiple rows with the same rate value, so you may still need a quantity of post-processing to check for that.